Artachat is a series of six discussions and debates addressing topical issues surrounding visual art in Uganda. 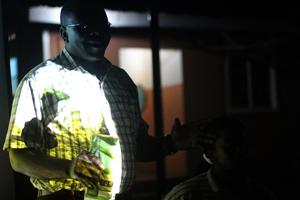 The first one took place on the 19th of February at 32º East in Kansanga, and their plan is to host one every month. and eventually encouraging lifelong learning. 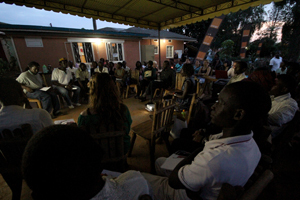 Artachat at 32º East, Kampala, 19 February 2013. “We are trying to find a way to excite our public spaces. We are asking ourselves questions like ‘What kind of projects can we do?’ ‘Who is our audience?’ ‘How do we ensure that the projects we start have continuity?’ and ‘How can an artist enter this dialogue of art in the public space?’” Muziri said. The idea is to have artists come together and drink from the sound wells of someone who has “been-there-done-that” and is still around. Someone who can inspire artists and listen to their issues and advise them accordingly. But before he begun, a short video clip about the successfully held KLA ART 012 festival, in which twelve artists showcased in twelve locations, was played. The participating artists included Xenson, Bwambale Ivan Allan, Eria ‘Sane’ Nsubuga among others. It called for a little introspection, but after that the night belonged to Jimmy. How did you start when some of them hardly knew your work? 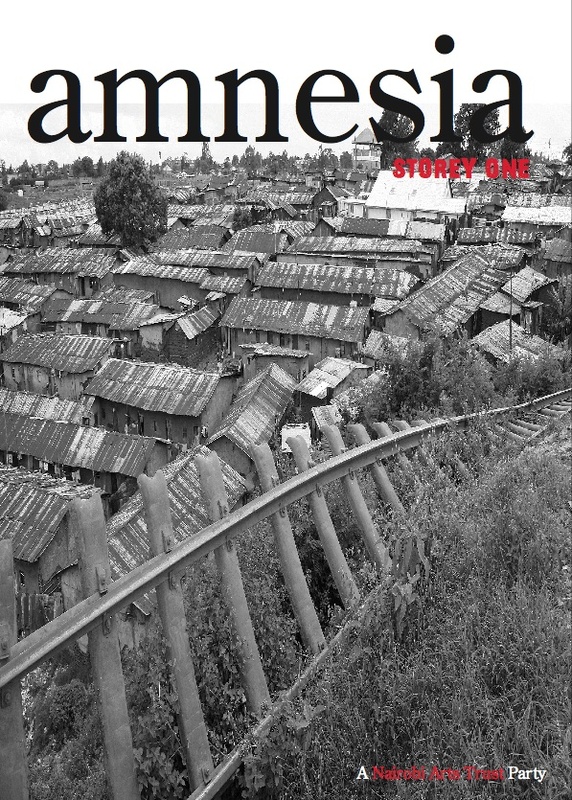 Jimmy’s most famed work, by the way, is a project called Amnesia, done in Nairobi, which addresses the issues of historical and cultural memory. The Amnesia project, by Jimmy Ogonga Nairobi Arts Trust. He was undaunted by it all. Yet, seeking a smooth landing, he appealed to Pan-Africanism. He expressed a desire to imagine Africa as one place, one continent, one people. A place where there are no lines marked on paper, marked in books and the internet, lines that don’t really exist. “We Africans are very interesting people. We have given the world so much, yet currently we are in a situation where we love being managed, we love people who do things for us. I wanted us to create our own space, where artists can come, sit down together and exchange ideas, articulate pressing issues, make publications, and write stuff that speak our own stories,” he explained. Together with a couple of friends, Jimmy Ogonga set up the Nairobi Arts Trust to create their own space and pursue the practice of art independently. 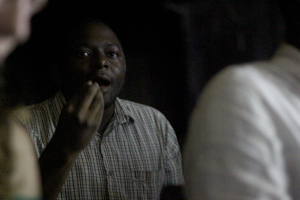 Jimmy Ogonga visiting a local studio. He reminisced regretfully on what it was like for Kenyan artists in the early 90s to share ideas with their counterparts in Uganda and vice-versa. The same was also true in Dar-es-Salaam with artists crossing over to Nairobi and Kampala. For Jimmy personally that didn’t stop him from seeking out Ugandan artists, and just last year, he worked with Afriart Gallery in a project which introduced him to Ugandan artists. But how does this whole talk of cross-border art exchanges fit in with art in the public space? According to him, to put art in the public spaces entails many things, especially in cities where in the past forty years Africans have embraced the rural to urban migration. “When you think about it, the urban development changes everything. The style of building changes from round to linear and square architecture,” he observed. 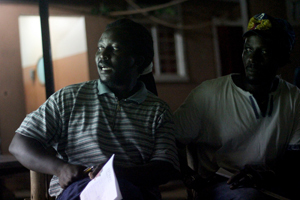 Jimmy Ogonga at Artachat Kampala. Also, cities are places of conflict. From crime to multiculturalism, there is a little bit of everything. It’s a place where people are always contesting for physical space, selling and buying, and navigating public transport. Yet, rather than look at it as a bad thing, he pointed out that the beauty of multiculturalism—a byproduct of cities—brings people together. And when you show people art to reflect upon, you have created a platform to communicate in a deeper way than just using words. “When you put art in a public place, you provide an opportunity for people to talk beyond ordinary conversation,” Jimmy emphasized. He pointed at museums as a space where traditional art takes center stage. And most of it is really public art, not art hung on the wall in a wealthy person’s house. No artist put their name on it and it wasn’t pieces that were bought and sold. “When we put art in a public space, we are trying to express a new-found freedom where we are saying: Art is not something that should be contained, whether in a room or a wall. You are putting it out there for the ordinary person to enjoy, perceive, imagine, articulate, take ownership of it, and be part of the production,” he said. 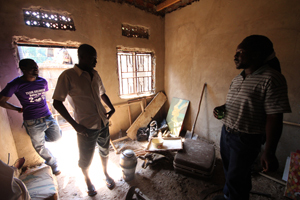 An image of the Kampala old taxi park was then presented, with the hope that everyone was familiar with the place. It was also to show how Africans have navigated their cities. “It is absolutely chaotic, but at the same time, you see a certain repetition, a certain order in the chaos. I brought it out to show that if cities can be imagined and made, then they can be reimagined and remade. I want our young artists to take more proactive action in determining how our cities should look, function and interact,” he added. A series of photographs of art from other parts of Africa like Cameroon, Kenya etc were produced with special emphasis on meaning. “You have to look at these places and give them meaning. What does it mean to someone who passes by every day, or one who works there and has lived there all their life? If you are to make a public art project, what kind of meaning or provocative element would you plant there to make those people interact on a different level? I would like to imagine the poetics of the city as well. What do you see when you look at a city?” he finished to applause. Later it was time to hear from a representative of the Kampala City Council Authority (KCCA), Alfred Okello from the Directorate of Physical Planning, Landscaping unit of KCCA. “You realize that in many cases, art has been associated with music and song. Public art has fallen under the token of public health,” he said without making things any better. “But I am here to let you know that the new KCCA is interested in the arts. We want our city to glow. We want to colour it. We are here to provide guidance on how to go about it. As you move through Kampala, walk with your eyes wide open. There is plenty of opportunity for public art which no one sees. Kampala is prone to traffic jam. I want the drivers to be looking at a piece of art, instead of contemplating how to maneuver through a pavement,” he continued. After that, the discussion was opened to the audience. This session kicked off with questions, most of them directed at Alfred. Bruno Ruganzu, an artist who incorporates recycling in his work, disagreed with Alfred on the issue of KCCA wanting to work with artists, citing an example where—under the umbrella of Uganda Visual Arts Society—they appealed for space in the city, but were turned down. “When you come to us as artists, you need to speak one language, and then we at KCCA can offer our guidance. The city is big and there are many people who live there. How you handle the city is very important, because there are different tastes to cater for,” Alfred responded. Serubiri Moses at Artachat, 32º East, Kampala, 19 February 2013. “It does take time, but mastering the use of diplomacy and helping the authorities see that you’re in fact helping them, goes a long way in resolving such issues, “ he concluded. That was Artachat, discussion one, brace yourself for another one next month. The date is yet to be communicated. But it is worth the time, especially if you are an artist considering art in the public space. This article was originally written for and published at Artachat website. All images by courtesy of Artachat. very very interesting and resourceful. i will get in touch with all involved,. thanks for the innovation and ingenuity.